Move your mouse over the map. When you see the hand icon ( ) You can click to visit the room or other area. There are 17 places with pictures. Can you find them all? Our virtual Tour only gives a guide. The best way to understand us is to visit the school and see us in action! Welcome to the front of our school! Usually there is little passing traffic, though we do get tractors, coaches and dog walkers passing the school gates regularly. Around the gate is where parents and carers usually congregate at the end of the day – a good chance to catch up with the latest news and share ideas. Back to the Virtual Tour map. This is where we welcome visitors to the school. 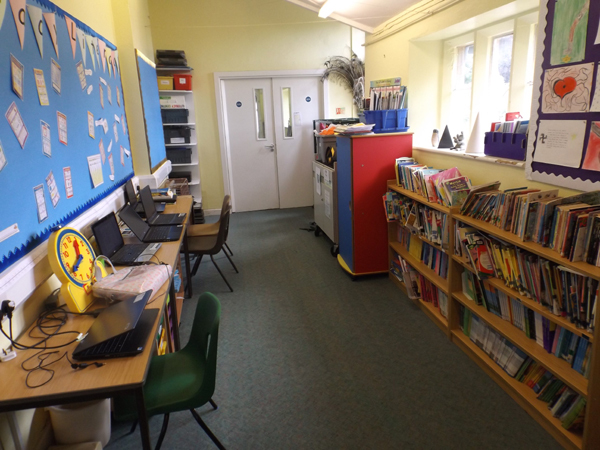 The area is also used to build library skills, to display our current School Value, for reading with volunteer helpers from the community, and if you need to wait while you are seated, you can watch photographs of the children at work (and play) on our rolling display of highlights from the previous year. The entrance hall was re-fitted in 2011. During the busy play and lunchtimes some children prefer to sit outside and play table-top games, or just talk with their friends. The quiet area should be an oasis of calm on a busy day, and can be very popular when the weather is hot. Here is the staffroom, a place for meetings and discussion, as well as a place to re-charge batteries ready for the next teaching session. The building is also used for break-out groups (teaching and learning, support and/or challenge), music tuition, cooking and governor meetings. Our hall is a special place for the whole community. We hold collective acts of worship here (assemblies) and also use the space for indoor PE (when it is wet, or for gymnastics or dance). 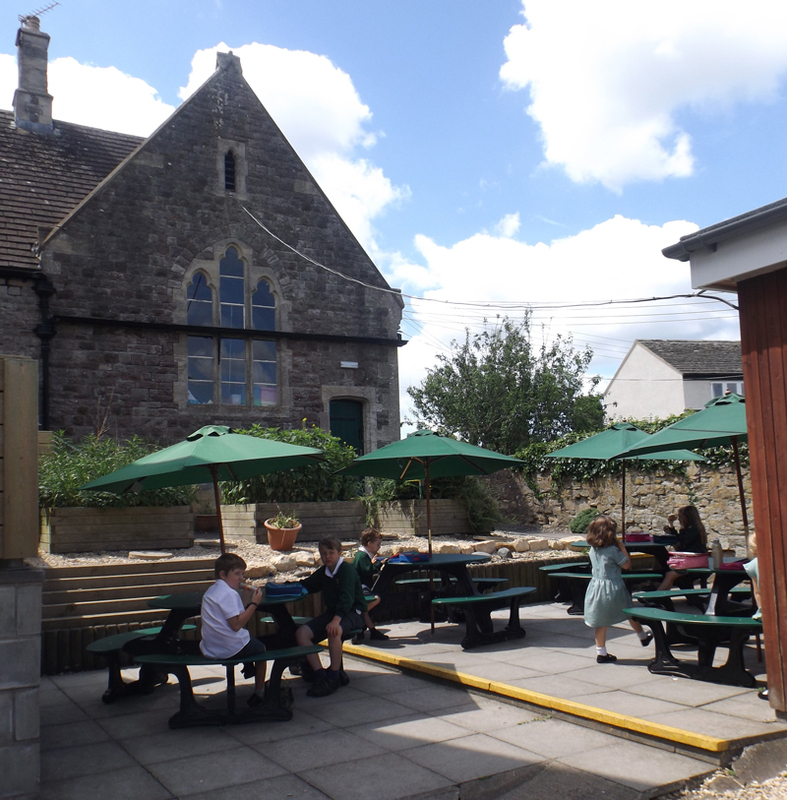 At lunchtime all the children eat together in here, unless the weather is fine, in which case we ‘picnic’ outdoors. The hall is a fantastic asset for the school. Each week we hold an ‘open’ celebration where certificates are presented, birthdays are recognised and the ‘Open The Book’ team share a story with the school community. Children often state that this is their favourite area in school. Certainly playtimes and lunchtimes are lively occasions, with several sports happening at the same time. One of the remarkable sights at North Nibley is the extent to which children from different year groups and classes join in and play with one another. It is not unusual for Year 6 to be playing football with Reception and Year 1 children! A busy hive of activity. This is the place to which our visitors report. Mrs Bargewell can usually be found here, answering the phone, responding to emails and making sure all the arrangements for trips, dinners, finance and paperwork are all up to date. If I’m not with children (or staff) I can usually be found here, holding meetings, making plans, checking up on pupil progress, reporting to Governors and a million other jobs which keep me busy. This amazing space, with its pond, mini-bug hotel, crazy paving, sun shade and story-telling area was hand-built by our clever parents and their friends, using money which had been raised to transform the wilderness which was here before. It was opened in time for the school’s 250th birthday! This corner of the playground has been transformed through the hard work of parents, children and staff alike, thanks to special funding and enthusiasm of the Polli:Nation Project. Thanks to the generosity of our parents and fund raisers, and with additional money made available by school governors, we have created a bespoke play space in the corner of the playground under the tree.